Trying to hang a hook from your ceiling or walls can seem like a challenging task, but given the right tools, instructions and supplies, hanging a hook from your ceiling is as easy as changing a lamp lightbulb. Before any real action is taken, it’s important to plan out each step of the project for maximum quality. When it comes to picking your supplies, the first thing to determine is what type of hook is needed. 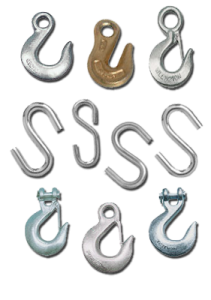 At Armstrong Alar, we stock everything from s-hooks, t-bar hooks, eye hooks, clevis hooks and more, each designed to excel at different tasks and weights. S-hooks for example are designed to distribute the weight more easily throughout the entire hook structure, however s-hooks are not to be anchored into wall or ceiling studs, but rather hooked to the object hanging from the anchored hook. T-bar hooks on the other hand are designed to be used on drop ceilings and are meant to hold as much weight as the ceiling itself can maintain. T-bar hooks are perfect for holding signs and displays but t-bar hook applications are endless ranging from hooking chains, to plants, to baskets and more. In most cases though, for anything above 5 pounds, any hook that screws into a wall or ceiling stud is the recommended hook to use. For weights below 5 pounds, an adhesive hook will do the job. Adhesive hooks are also easily removable and won’t damage the surface they’re attached to when removed. Once the proper hook is chosen, make sure the correct tools are being used. It’s important that the right tools are used as using the incorrect tools can often result in injury and poor project quality. To install a hook into a ceiling, a few different types of tools are required. Probably the most obvious tool needed if you’re working with heights! A stud finder will allow you to easily find a stud in the ceiling or wall to drill and screw the hook in. It’s important you install your hook into a stud or risk your hook being ripped due to improper anchoring. Needed only to mark the location of the stud and drill location. While you can manually drill and screw in your hook, the task will become much easier with an electric drill at your disposal. It’s important to not drill a hole larger than the diameter of your hook. Locate the general area on your ceiling or wall you’d like to install the hook. Move your ladder where necessary if needed to reach the desired location. Use your stud finder to find the nearest stud in your desired location and mark the spot using your pencil. Remember to compensate for the drop length of the item being hung from the hook. Double check your location is correct. Find the proper drill size and drill slightly into the stud where you’ve marked. It’s important not to drill all the way through. Insert the hook screw into the shallow drill hole and start to turn clockwise, slowly apply more pressure as the hook grips the stud until the screws cannot be seen from the surface. Every business out there knows the importance of brand recognition. Getting your image seen is key to driving new customers and while keeping previous customers coming back. It’s for this reason that we at Armstrong/Alar provide high quality sign hanging chains and equipment to keep your sign hanging in front of customers for years to come. For non-business owners just looking to hang a simple sign, don’t worry we’ve got you covered too. Our sign hanging chains and equipment are designed to be used by anyone for any sign shape, size and weight. For immediate response, give us a call at 900-927-8549 or fill out our contact form to the right and we’ll contact you as soon as we can! Signs of all sizes generally use the same sign hanging chains and equipment, however the sizing of the chain increases as the weight of the sign increases. Armstrong/Alar carries both welded and weldless chains to suit your sign hanging chain needs for better customization. The type of hook and s-hooks you use is also very important to help distribute the weight of the sign better. Each hook is designed differently so it’s important to choose the right size to accomodate the sign weight. If you have a custom job requiring specific chain or other equipment, please contact us on the form to the right or give us a call at 800-927-8549 and we’d be happy to work with you!